I should really brush up on my spelling before tackling local dog owners. 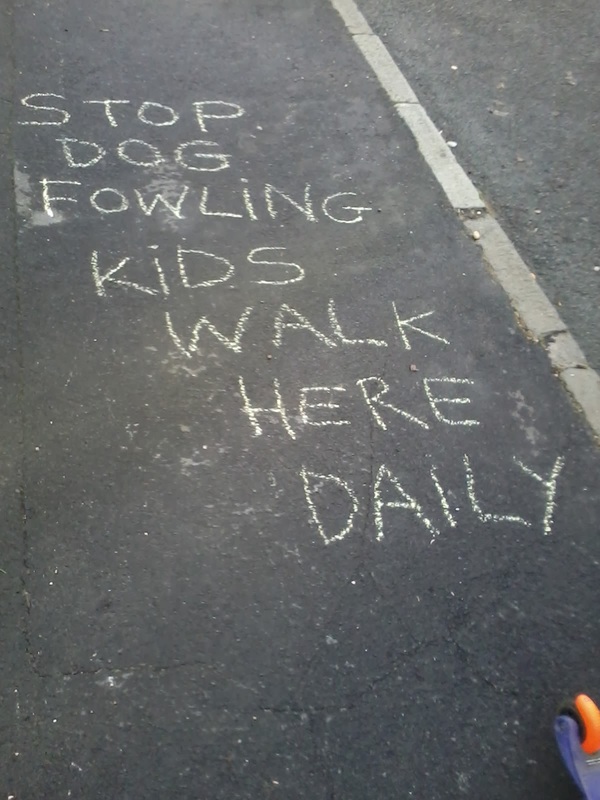 The more educated canine might think, okay, so I can't chase any chickens here now, but I can still use the pavement as a toilet. Yes, I am really angry about the endless dog poo in our area. I phoned a community dog poo lady from the council - although that may not be her official title. She did her best by asking 'community officers' to patrol the area, but she said the legislation was woeful. I'd like to see a new, 'stop and search' campaign. If the dog owners can't produce a plastic bag, then the police should take down their address and give them a verbal warning. It's vile and disgusting and bacteria therein can lead to kids going blind. Really. It makes most people really angry. How can we pool our collective wrath and close in on the offenders? More chalk and correct spelling might be a start. It's vile, and a problem in Crieff too. Instead of talking about interesting things with my wee children out on walks, I spent the whole time telling them to mind their feet! Hey! I just saw your blog for the first time. And I saw your message on the pavement! Thanks for both.